Jo Whiley, Simon Mayo and The Hairy Bikers. Photo - BBC. 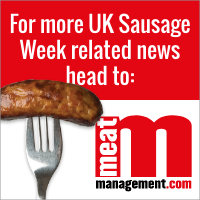 BBC Radio 2 presenters Jo Whiley and Simon Mayo were joined by The Hairy Bikers on their show to mark UK Sausage Week. 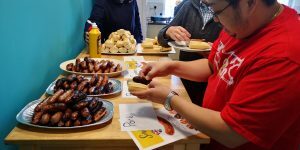 The presenting team showed their support for British bangers by sharing their listeners’ favourite sausage recipes and tips. 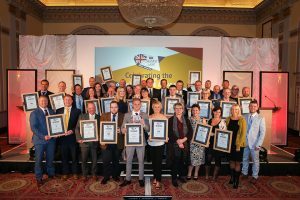 Whiley told her listeners: “This week around the UK, everyone is celebrating UK Sausage Week. A discussion then ensued, with both Whiley and Mayo describing what they feel makes the best sausages. Mayo then asked listeners to send in their tips on how to make the best sausage. One listener described his top sausage recipe as ‘two-part sausage meat and one part cooked haggis with gently cooked onions and sage’. Another viewer shared tips on how to cook the perfect sausage, advising to cook ‘slow and low’. A food writer also contacted the show and advised that, when making a good sausage, texture is needed – preferably a good mix of fat and creamy meat. Spice can then be added, however it is important not to let spice overwhelm the sausage! Television and cookery-book duo David Myers and Simon King, also known as the Hairy Bikers were also involved in the discussion, and advised listeners to not prick the sausage before cooking. “You don’t prick them. That’s the first secret, as you’ll let out all the juices and it won’t allow the meats the cook,” the duo agreed. 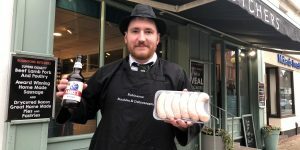 After being asked what sausages they would choose to cook for UK Sausage Week, they both agreed that it would be either a Cumberland or Lincoln sausage. They also advised to keep some rusk in the sausage, and to pair the final product with a classic brown sauce. 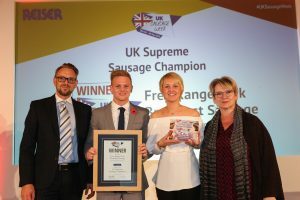 “There is something special about British sausages, it is marvellous,” the duo concluded.